SJ Expo – brand-new Joomla template has been released with support for K2 component. Based on YT Framework, enabling responsive layout, offering short-codes collection and more, SJ Expo is unique and easy to set style for content without much coding knowledge. Metro inspired design is used specifically for this joomla template, so you would show visitors a very cool modern style… Last but not least, responsive web design layout of this template is great for any display devices, allowing to easily set-up international Website about exhibition, exposition locations and events. 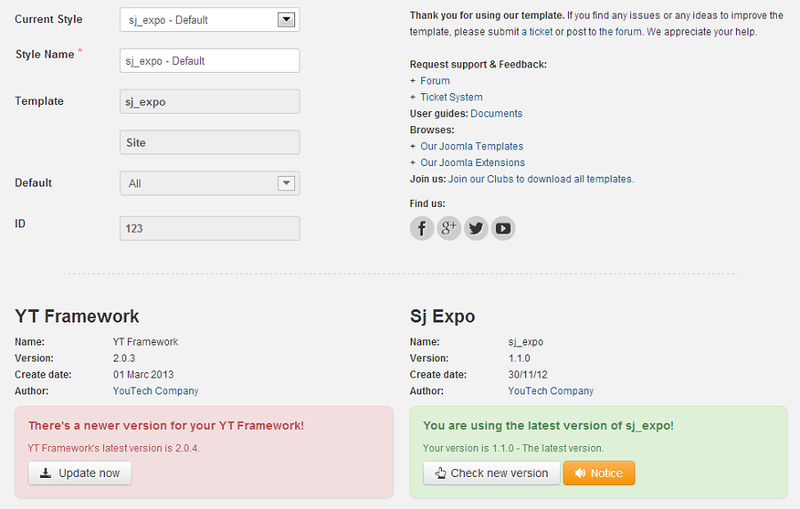 Based on YT Framework version 2, updating and notifying with SJ Expo is easier than ever. We have auto notification for any future template update that is visible within back-end. 8 options categories are available for your choosing, would visually tweak almost all of theme options namely menu styles, language direction, fonts… You completely control how the Website layout and appearance would be, easily with our front-end cPanel. This is our most comprehensive panel ever. Any advanced options such as CSS/JS optimization, Google Analytics, Lazy Load… would be easily change within one click. Based on powerful framework, SJ Expo theme is with many advanced options to use. 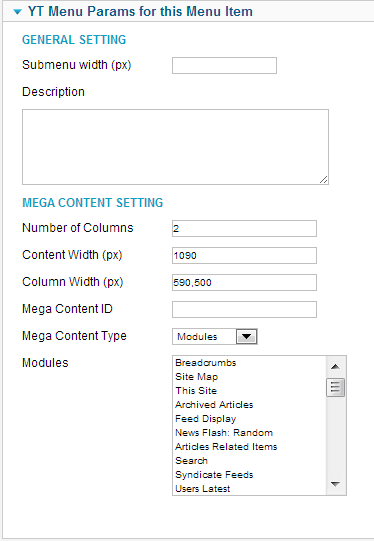 Extensions here are built in-house with ability to show any complicated content. 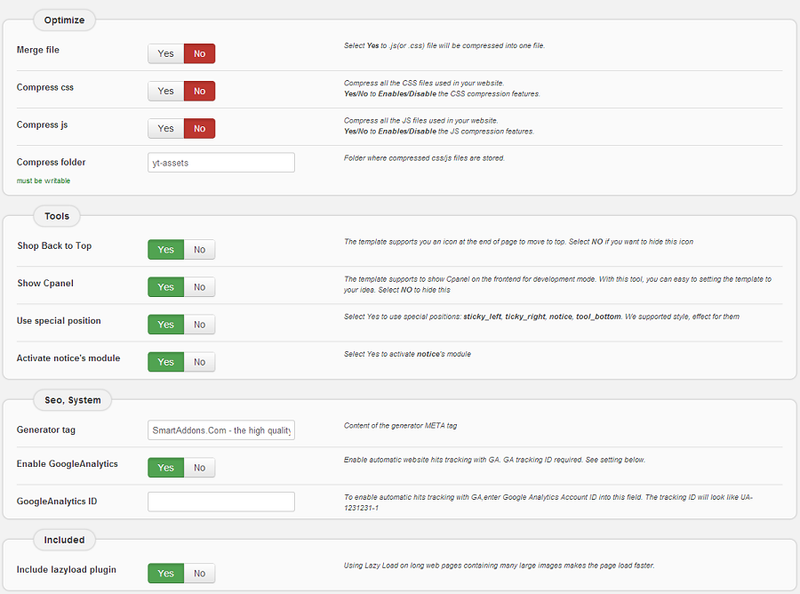 Back-end to configure these can be found under Module Manager and quite easy to tweak. The layout below shows some featured positions on homepage, others are for your imagination because multi-module feature of our modules would be suite any need. Mega Menu and Shortcodes with SJ Expo are based on YT Framework, too. These are some kinds of missing features that Joomla! have not offered till now. We will show any kind of content into menu and very quickly by using short-codes. Sound good right? 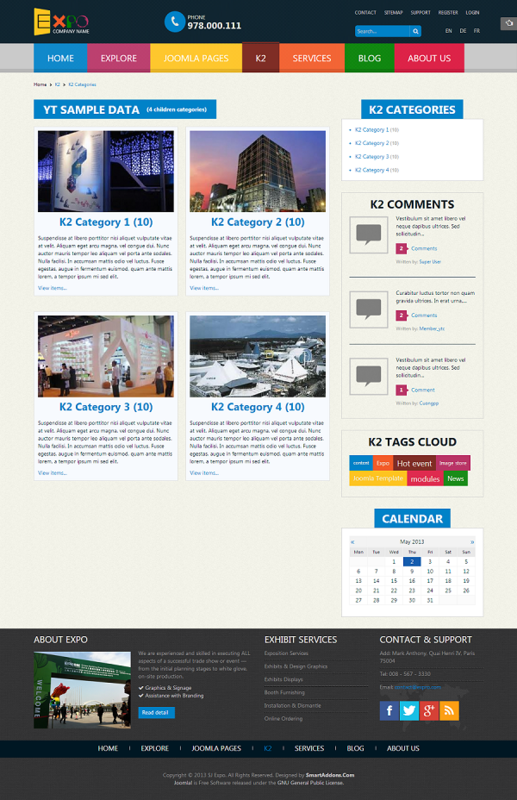 K2 is used in SJ Expo to post content and control layout of each items. Besides default Content component, this is worth to try. So any event can be shown with comments, rating and tags.